The Democratic secretary of state in New Mexico thinks voters are incapable of filling out their ballot without help. Maggie Toulouse Oliver penned an editorial in the Albuquerque Journal advocating for the return of straight-ticket voting, which would allow voters to check one box, such as Democrat, and vote for every Democrat on the ballot. 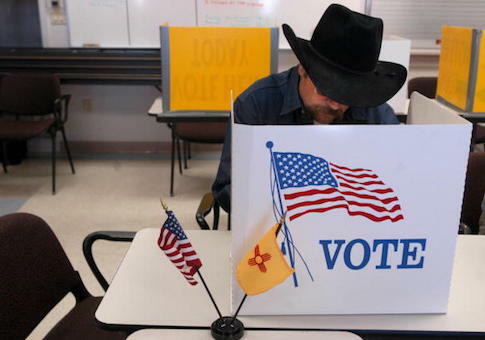 "New Mexico had long utilized a ‘straight party' voting option until 2012, when Dianna Duran, the first Republican secretary of state in New Mexico in 80 years, ended the practice behind closed doors with the stroke of her pen," Oliver writes. "There was no discussion, no public input and no transparency. Duran's was a clearly partisan decision—with the full support of her political party—that was part of an overall plan to both undermine trust in our election process and to make it more difficult to vote." Oliver argues picking the candidates voters want is "long and complicated," and therefore they need to be told who to vote for based on party. She said having voters choose every candidate they are voting for is "voter suppression." "Simply put: the decision to end straight ticket voting in New Mexico was a cynical partisan attempt to make it more difficult for New Mexicans to vote," Oliver said. Oliver also claims voting is too difficult, unless voters can just check the "Democrat" box. "Unfortunately, some see practices that ease the voting process or encourage more people to vote as negative," she said. "Their goal is to make it as hard to vote as possible because when more people vote they lose. And they'll do anything to try and convince voters otherwise." "Straight party voting makes it much easier for voters of all stripes to cast a ballot," Oliver continued. "The reality of straight party voting is that more voters will be able to participate in the voting process, and the process itself will be quicker and easier." The true problem, Oliver explains, is voters cannot understand ballots. "Ballots can be long and complicated, often discouraging some voters—particularly the elderly and those with disabilities—from participating in the process," she said. "The straight party option eases the burden on these voters, making the ballot more accessible overall," Oliver added. "The practice is also logical from an administrative standpoint because voters spend less time at the voting booth when they choose the straight party option, reducing wait times at polling places." Very few states have straight ticket voting, and the New Mexico legislature first abolished the practice in 2001. Secretaries of state, until Duran, unilaterally implemented straight party voting until 2010. Duran abolished the practice in 2012, "noting that it had been repealed by the legislature." This entry was posted in Politics and tagged New Mexico. Bookmark the permalink.